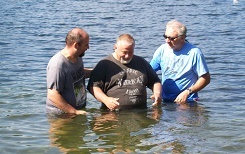 We believe that Baptism is an outward expression of an inward decision to follow Christ. Baptism is for those who have accepted Jesus as their Savior, and is not a requirement for salvation, but is a visible commitment to Jesus Christ. If you’d like to be Baptised, or if you have questions about Baptism, please contact us, and we’d be happy to answer your questions!